My mission is to create a ripple effect of people so successful that they not only create the life they want, they also become the inspiration for others to do the same. IT’S not about overworking yourself or running yourself to the ground.It’s about knowing what you’re worth and going for it. OK is NOT enough isn’t about perfection – it’s about continuous progress and levelling up. OK is NOT enough is about raising our standards, refining our discipline and reinforcing our dedication to producing better results – no matter what your own vision may be. 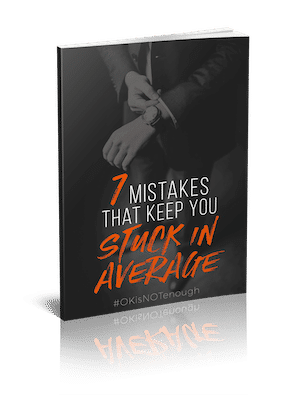 OK is NOT enough is about never settling for average. Somewhere in my mid-20’s, I realised that I’d been settling for “OK” results. For the most part, I’d been choosing what was easy, and I was – at best – showing up as average. I had no idea where I was heading. There was no plan and no vision. At 24, I was working as a trolley boy. I was selling drinks and sandwiches from my trolley to office workers in a bank, and it was easy. It was also a great vantage point to start a shift in my standards. My customers were around my age, but unlike me, they were confident, well-dressed, and making a great salary. And then one day something just clicked. I was embarrassed and angry with myself for settling for easy. I made a choice there and then: I no longer wanted to be average. OK was NOT enough. Being mediocre? Not an option for me – not anymore. So I don’t have a tragic story. I just decided one day that OK was NOT enough, and I kept going. I never looked back. With my standards raised, I worked hard and invested in myself to become someone I could be proud of. I read dozens of books and attended seminars on personal development. Simultaneously, I completed my degree in Psychology, worked my way up to a managerial position in my full-time employment and completing coaching certification courses. I built a new network and an inspiring, success-driven environment. And I was mentored by the kind of coach I myself wanted to be. I turned my life around and designed it so that I can enjoy life while doing what I love: helping others to do the same. Today I run a very successful coaching business and work with ambitious entrepreneurs and professionals, taking them through my unique 3-step process designed to help them get extraordinary results. If you’re currently fed up of knowing that you can do better in life, I’ve made it my mission to get the best out of you. I love collecting mugs but only really use my two favourite ones. Some people say I’m obsessive, I call it committed. I’ve always wanted to try fried insects. When I was 8 I was determined to become an astronaut, but when someone told me that astronauts cannot have tooth fillings, my dream bubble burst. I had one. I love metal music. As a teenager I wore leather boots, jacket and pants, had long hair and I was in a band. I love plants especially orchids. Elon Musk is one of my biggest inspirations and role models. 90s films are my favourite. I’m not too impressed with CGI – so yes to Terminator, but Transformers? Too much. I find the sound of running dishwasher incredibly relaxing (and not because I don’t have to do the dishes). As a child I had a dog, a cat, a rat, a whole fish tank and a chameleon as pets. I’ve always thought sleeping is a waste of time, so I learned how to lucid dream to make some use of the time I’m asleep. If I weren’t a life coach I’d be an astrophysicist. I love space.